Quicksilver Mine Co.’s new Gallery in downtown Forestville presents an exciting Exhibition of wood fired ceramics beginning on November 28. This Show features work by 18 Bay Area based ceramic artists who create and fire their work using six different wood fired kilns here in Northern California. 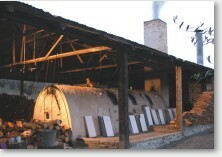 Unlike firing in traditional gas or electric kilns, wood firing is particularly challenging and labor intensive. 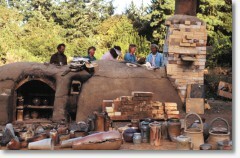 Painstakingly constructed out of brick, masonry, and mortar, and often with recycled materials, wood fire kilns are built outdoors, and usually fired in the spring or late fall in California. 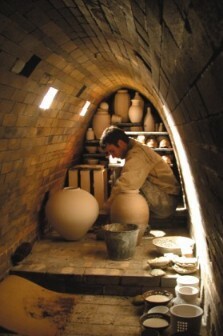 These kilns require a particular dedication to both the process and to the art. 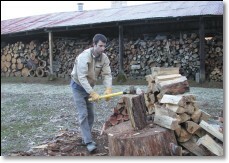 A typical firing requires gathering, splitting and preparing enough firewood to last anywhere from three to seven days. Once the firing actually begins, a team of artists stays on site, eating, sleeping and working together for up to a week until the entire process is complete. Ceramics produced in wood fire kilns are exciting and unpredictable. Anything from small tea bowls and cups to large extruded fine art sculpture and wall pieces can be created using this process. Glazes, affected by ash and smoke and variations of temperature inside the kiln are often blistered and bubbled, creating the supremely unusual effects avidly sought by collectors. Quicksilver’s Exhibition FIRE IN THE BELLY will include work by artists from Pope Valley Pottery and the Burton Creek Kiln , both in Pope Valley; the Dancing Fire Wood Kiln at Solano College; Kilns of the red Clay Ranch, Ukiah; the Second Hand Rose Kiln in Occidental; and Holt Ceramics, Berkeley.